Let us bring you a timeless theme with a new twist. Sail into the sunset with this fabulous votive candle. Nautical themes are always popular and bring with them wonderful memories of long relaxed sunny days at the beach and ships sailing into the sunset. Capture the spirit of the sea in this stunning blue and white votive candle. The navy blue glass votive stands in a white resin base with a wave design in light blue. A classic ship sails through the waves. It features blue and white sails and a matching life ring. 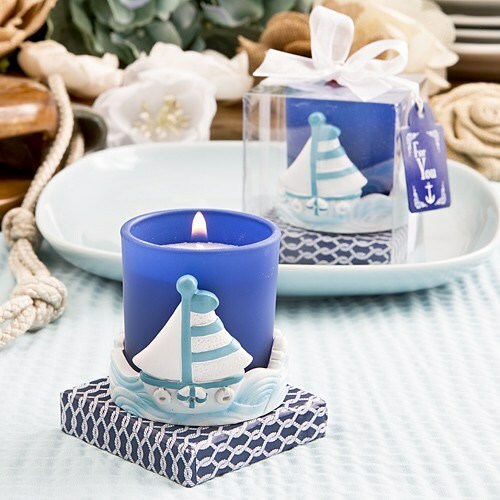 This charming nautical style votive is sure to add a feel-good ambiance to a beach or sea themed event.